Some long days, tough climbs and even tougher descents, but so worth the effort. 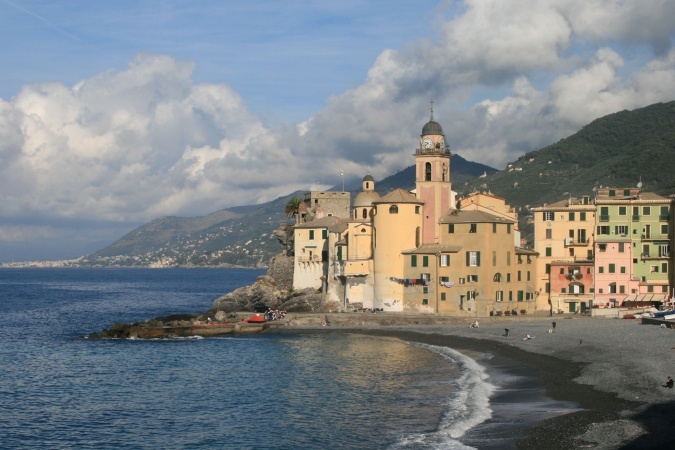 We finished with three nights in Camogli for some well-deserved 'R&R'. We spent our first two nights at Villa Arabella in the small village of Mornico Losana. Our hosts, Arabella and Paul, made us very welcome - Arabella's cooking was excellent, and Paul didn't need much of an excuse to break out the local grappa! Day 1: 11.2 miles. From Mornico Losana we set off through vineyards (and a few spots of rain) for a 'gentle' introduction to the salt road. Day 2: 17.3 miles. First stop after leaving Boccapane was the church on top of the hill in Ruino - quite a climb to warm us up for the longest day's walk on the trip. Day 3: 15.2 miles. This was supposed to be *the* killer day. It turned out to just be *a* killer day! We spent most of the day climbing, up from the river valley, over 1100m to the high ridge we'd follow for the next three days. We had considered taking the boat again for a trip to Portofino, but the weather was against us - no boats in or out of Camgoli today!